Welcome to the Fit Small Business Xero training course! In this lesson, we’re going to cover how to create a balance sheet report in Xero. Why It Is Important To Create A Balance Sheet Report? The balance sheet report shows the assets, liabilities and owner’s equity of your business as of a point in time, (e.g. as of December 31, 20XX). The balance sheet report provides you with the net worth of your company which, in other words, shows what your business owns (assets) versus what you owe to others (liabilities). Similar to the Income Statement, which we discussed in the previous lesson, your Balance Sheet will only be as accurate as the information you have entered into Xero. Therefore, you must do a good job of entering all invoices, bills, credit notes and banking transactions into Xero in a timely manner; we recommend at least monthly if not more often. Identify assets, liabilities or equity transactions that have been categorized to the wrong account. Catch missing assets or liabilities which could cause inaccurate financial statements. Take proactive steps to improve your overall net worth. Below is a sample Balance Sheet report for our fictitious company, Acme Web Pros Plus. Balance Sheet report created in Xero. 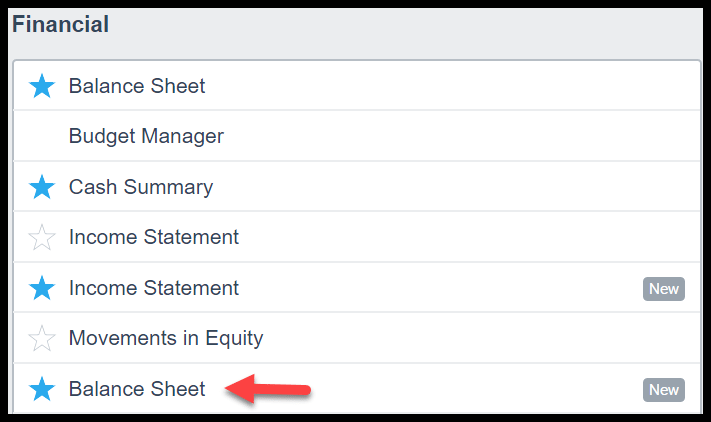 Follow the steps below to create a balance sheet report in Xero. 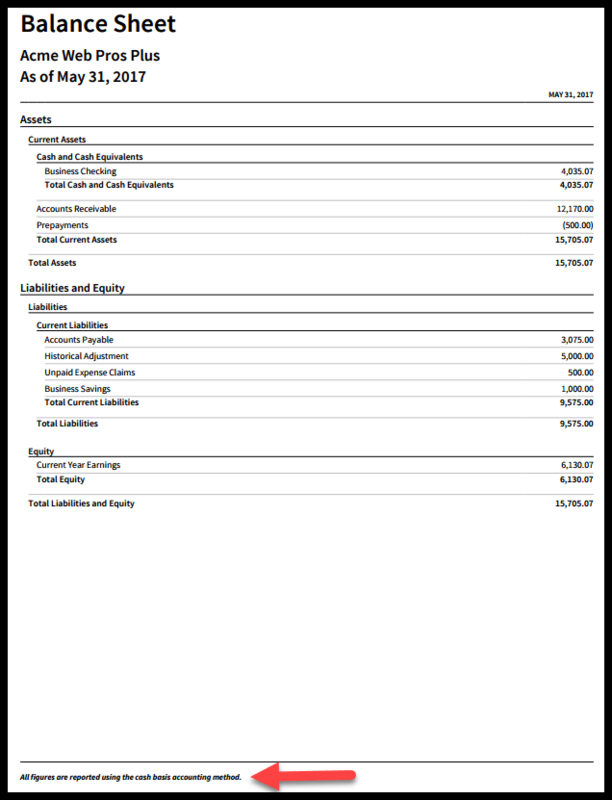 The Balance Sheet report is located in the Financial section as indicated in the screenshot below. Run a Balance Sheet report in Xero. Note: Notice that there are two Balance Sheet reports. Xero has redesigned several reports and the Balance Sheet is one of those reports. For the purposes of this lesson, we will discuss the New Balance Sheet report which has the “New” button located next to it. Note: You can add a report to your favorites by clicking on the star to the left of the report name. We have done this for the Balance Sheet report so that the next time it will be available directly on the Reports menu. In the next screen, you can select the date that you would like to run the report for as indicated in the screenshot below. Date Range: From the dropdown, you can select a preset date range (i.e. End of Last Financial year, Today) or you can select a date from the calendar. Update: Once you have selected the date range, click the “Update” button to refresh the report. The Balance Sheet report can be exported to PDF, Excel or Google Sheets. Scroll down to the very bottom of the report and click the “Export” button as indicated in the screenshot below. 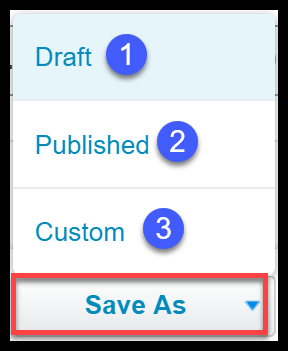 You can also save the report as a draft, published or custom report.To do so, scroll down to the bottom of the report and click the “Save as” button as indicated in the screenshot below. Draft – This option allows you to create a balance sheet report that you or someone else can make changes to later on. You might create several draft balance sheet reports before you are ready to publish them. Custom – Use this option if you want to save the format of the balance sheet report so that you don’t have to recreate it each time you run the report. Xero will ask you if you would like to make this template your default. 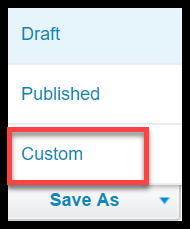 We will show you how to save a custom report format in the next section. We will walk through how to do each of these next. In the example below, we changed the title of the report from Balance Sheet to Balance Sheet Report. 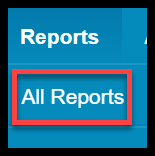 The options available in report settings will depend on the type of report you are running. You can find the report settings option located directly to the right of the date range for every report, as indicated in the screenshot below. Below you will find the report settings available for the Balance Sheet report along with a brief description of each. 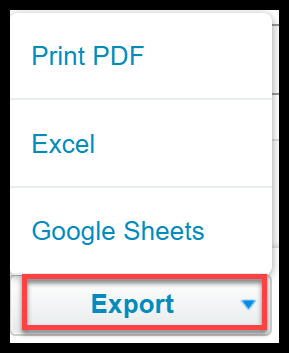 Modify Report Settings in Xero. Accounting Basis – In general, most businesses use the cash method of accounting. However, Xero allows you to use either method (accrual or cash) to run your reports. Note: The default reports are run using the accrual accounting method. Numbers – If you prefer not to have decimals show on your report, simply remove this checkmark. Update – Be sure to click the “Update” button so that the report will refresh with any changes you have made. Add rows or columns to track totals or notes. Rearrange rows and columns by dragging and dropping them. Listed below are the steps to add the footer and save report as a custom report so that it will include the footer each time the report is run. Scroll down to the bottom of the report and click on the “Edit Layout” link as indicated in the screenshot below. Navigate to Edit Layout in Xero. To add a footer, click on the footer icon located in the toolbar as indicated in the screenshot below. Edit Layout Toolbar in Xero. The footer will open up and you can type directly in the box, make the text bold and even highlight it as you can see in the screenshot below. 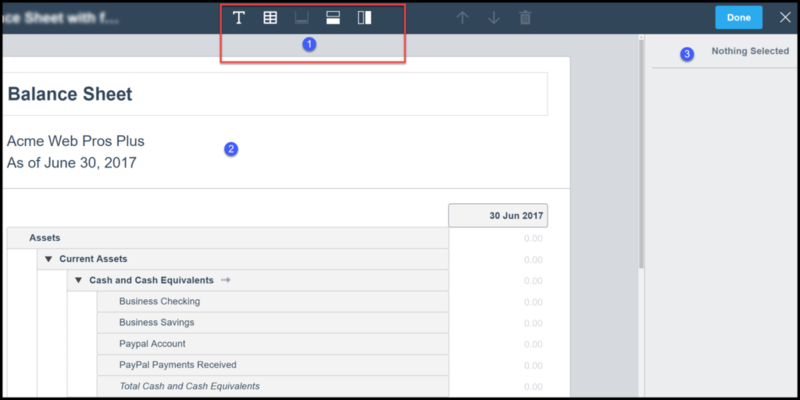 Add a Footer to any report using Edit layout in Xero. 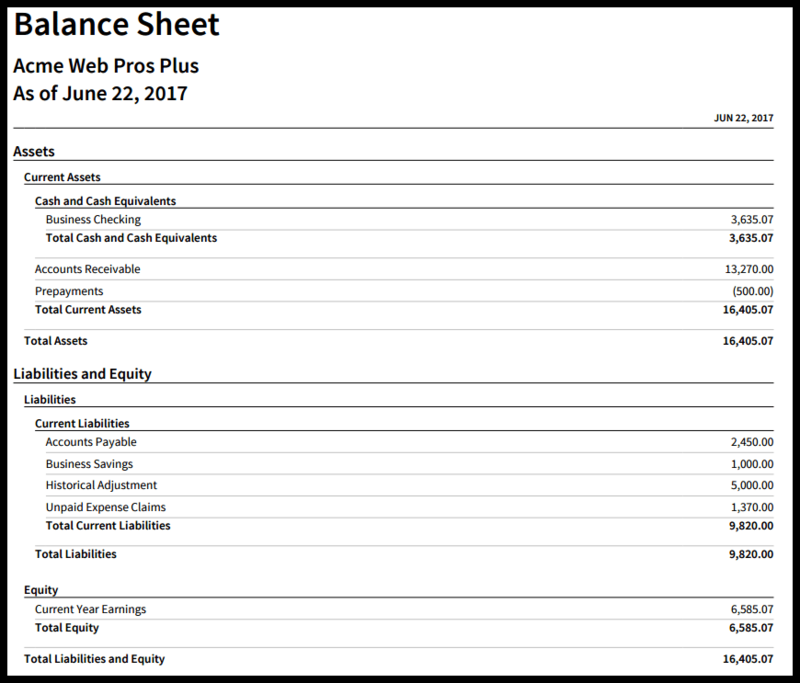 Below is the updated sample balance sheet report for our fictitious company, Acme Web Pros Plus. Sample Balance Sheet report created in Xero. Scroll down to the bottom of the report and click the “Save” as button and select Custom as indicated in the screenshot below. Indicate the name that you would like to use to save the report in the next screen. How to save a customized report in Xero. Note: If you would like this report to replace the default Balance Sheet report, be sure to put a checkmark in the box as indicated in the above screenshot. That wraps up the section on how to create a balance sheet report. The next lesson in our Xero Training Course will be how to create a cash flow statement. In this lesson, we will discuss the importance of reviewing your cash flow statement and walk you through how to create and customize the report. To access this lesson or any of the others in the series, click here. For a free 30-day trial of Xero, click the link below.